10. #OccupySocialMedia – If Organized Religion was nearly as useful to you as Social Media, why are most of your friends not following your faith? 9. #OccupyTelevangelists – It makes great TV. 8. #OccupyInternet – If Religion is supposed to adhere to the old ways, why are there any religious websites? 7. #OccupyNature – If man was meant to follow any particular religion, why are there so many? 6. #OccupyScience – Religion proves that Science is imperfect, because . 5. 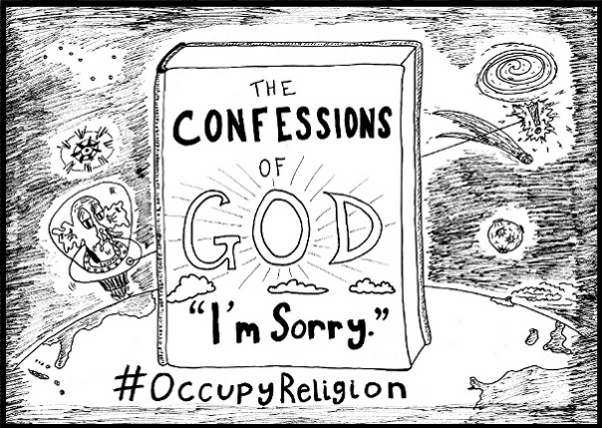 #OccupyHaiku – Religion is good. It proves some adults, like kids, need supervision. 4. #OccupyBelief – If you can believe that Religion is part of God’s plan, then why did he give you one that makes your life so unpleasant. 3. #OccupySkepticism – 1% of the most powerful people believe what the other 99% know is nonsense. 2. #OccupyIndoctrination – Teaching our children that the best way to relate to religion is to stay out of it and exercise free will. 1. #OccupyGod – Demanding a fair share of divinity, because the top 0.000000000000000000000000000001% of the Universe controls the welfare of the other 99.9999999999999999999999999999%. 10. #OccupySocialMedia – Friend, Follow, Circle – You Aren’t Steve Urkle. 9. 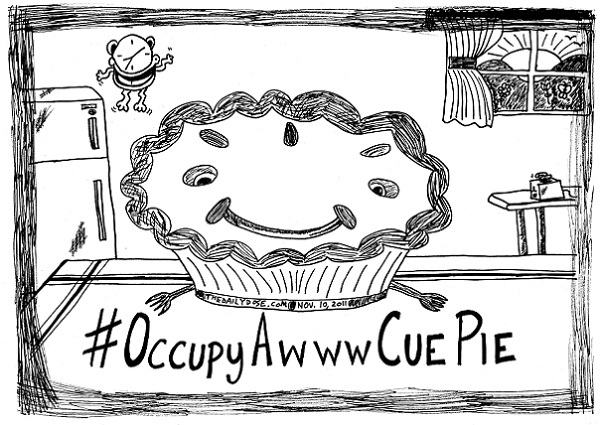 #OccupyKitchens – People Are Calmer On Full Stomachs. 8. #OccupyInternet – How SPAM Killed Email as the Killer App. 7. #OccupyNature – Destroying Beauty. 6. #OccupySpace – Destroying the Universe, one Galaxy at a time. 5. #OccupyHaiku-IfYouCanMakeItForTwo-ThatWouldBeGoodToo – Yes We Can make it. If hope and change will take it, we will not break it. 4. #OccupyShelfspace – The Super Stories of Super Stores. 3. #OccupyTime – Tick Tock Watch the Clock. Did you remember to secure the lock? 2. 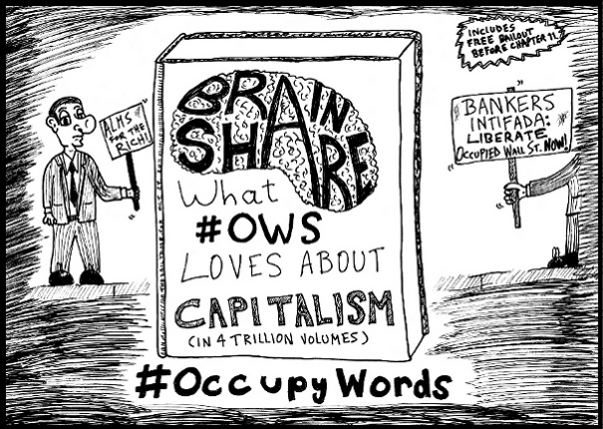 #OccupyOccupations – DIY Bailout – Just Like The Government. 1. #OccupyGenius – This Group Is By Invitation Only and includes these different thinkers: Steve Jobs. Albert Einstein. Jim Henson. Mozart. Groucho Marx declined to accept. 10. Social Media: Shoe string theory says that all things are connected on a subatomic level. So why does anyone need Social Media? 9. Physics: Everything is connected. Everything is relative. All relatives have souls. So your soles are connected to your neighbor’s Great Aunt Methuselah, even when she’s cackling and chasing you around with her rolling pin. 8. Internet: If shoestring theory states that everything is connected, then why does my computer say it’s Not Connected to the Internet? 7. Nature: If mankind was meant to use shoestrings, why weren’t we all born with shoes on our feet? 6. Meta-Physics: An object can exist in two places at once, especially if it is tied together by a shoestring. 5. Haiku: Shoestring theory rules shoemaker business models, built upon our soles. 4. Politics: The shoestring theory of politics dictates that you connected to the acts of government even if you can’t tie your shoes. 3. Capitalism: The shoe string theory of capitalism argues that when the wealth is controlled by the few, there is a tie-down effect to the many. 2. 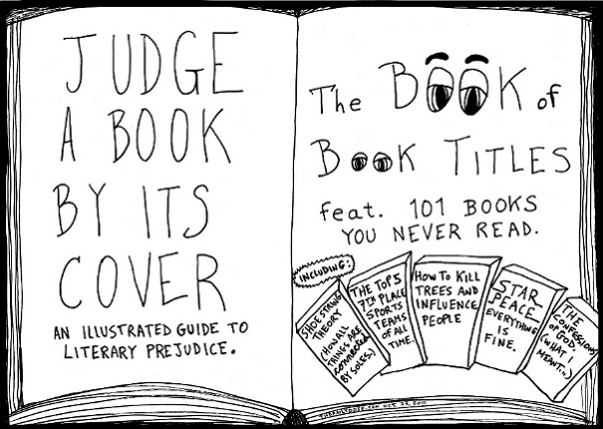 Iambic Pentameter: William Shakespeare wrote many sonnets, his shoe string theory lost in a bonnet. 1. 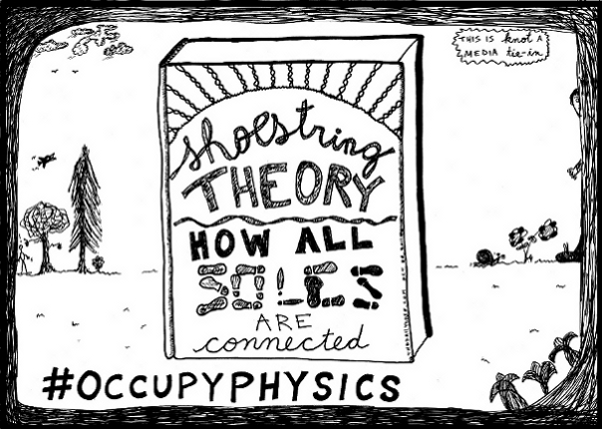 Occupy: #OccupyShoeStrings is a protest movement against the wealthiest 1% of souls who control the other 99% of soles. 10. 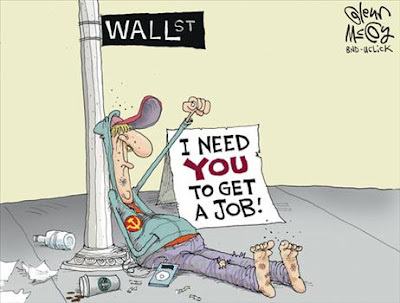 Economy: Wall Street economists don’t understand what the 99% are complaining about. They suggest, instead, that we just assume everybody is wealthy and just managing their wealth poorly. 9. 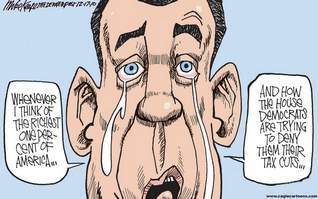 Haiku: Ninety-nine percent want what the one percent have, to be diminished. 8. PR: The 99% are scoring terrible public relations points in conservative media, because unlike the wealthiest 1%, their viewers can’t relate to the protesters. 7. Education: The 99% protesters blame the wealthiest 1% for not paying enough while the 53% pay for the unfocused demonstrators to kvetch, not to work, and ignore the math. 6 Iambic Pentameter: Ninety-nine percent has set up a tent. They’re demanding more jobs and lower rent. 5. 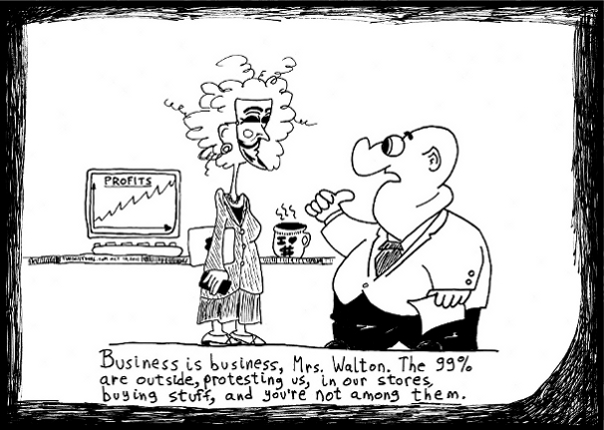 Walton vs. Wall Street: WalMart is owned largely by Mrs. Walton, America’s wealthiest woman, who got her money the old fashioned way. She inherited it. Wall Street suggests more people in the 99% try that. 4. 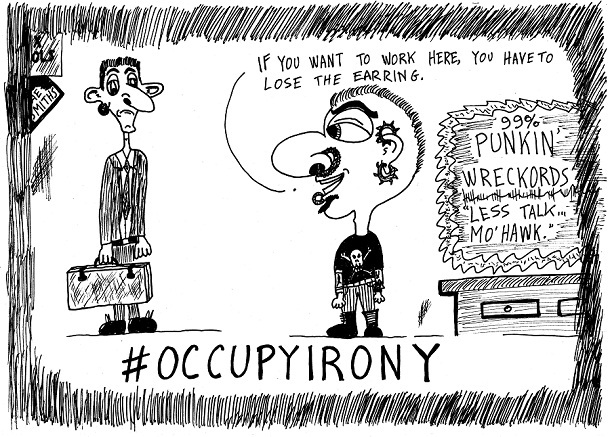 Irony: Less than 1% of the population is actually out there, protesting and claiming to be in the 99%. 3. Social Media: The wealthiest 1% love the 99% using social media to organize their Occupy Wall Street movement, because they own them. 2. Politics: In Washington, DC, The #OccupyKStreet movement is welcome to wait in the lobby. 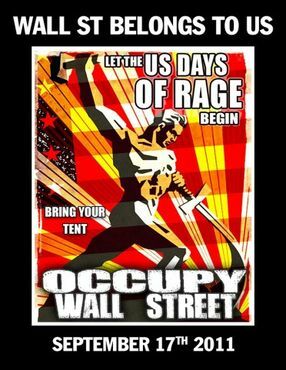 1. Business: The top 1% of the top 1% wealthiest people support the #OccupyWallStreet movement. However, the other 99% of the wealthiest people, do not.